At ArtFactory.com we build the highest quality, custom door hardware and custom wooden doors on the market today. These fine art quality long pull style door handles combine modern style with old world craftsmanship. The difference between door knobs, pulls, and handles, that are meant to be disposable, and ones that is built to last is in the details of the craftsmanship and materials. That is why we build our products from solid, hand forged wrought iron. Unlike other metals, wrought iron does not corrode with exposure to the elements. Wrought iron lasts for centuries, and builds a patina that will only look better as time goes on. In addition to top grade materials, we also believe in manufacturing our products using time consuming, tried and tested methods from antiquity. Our hardware products are never cast, drop forged, or made using any other fast process. All custom handles are hand forged by master blacksmiths using hammer and anvil over a coal fired forge. This method allows for a product that history has proven will last for generations. Additionally, each piece is a one-of-a-kind never to be exactly reproduced. Furthermore, details such as the genuine full grain leather wrap that is intricately hand woven are what separates our products from anything else on the market. All of our hardware is certified fine art quality. Not only is each piece built uniquely by the hands of one master metalsmith, but also under the supervision of world renowned artist H.J. Nick. Every product is certified with the H.J. Nick signature, thus ensuring that your product is a work of investment quality fine art with appreciable future value. To top it all off, all of our hardware is advance patinated using our proprietary iron oxide process. In this process, the patina finish is hand applied, and then heat infused at over 1000 degrees. The long pull style door handles as pictured have been finished with a black patina that will look beautiful from day one, and for years to come. It is our belief that when it comes to custom door hardware, you will not find a better product available anywhere at any price. That is why we use only the highest quality materials, and time tested methods of craftsmanship. Additionally, we offer our products at factory direct pricing. Not only that, but when we say made in the USA we mean it, every product is made in our Scottsdale, Arizona factory, the same way that we have done it since 1913. 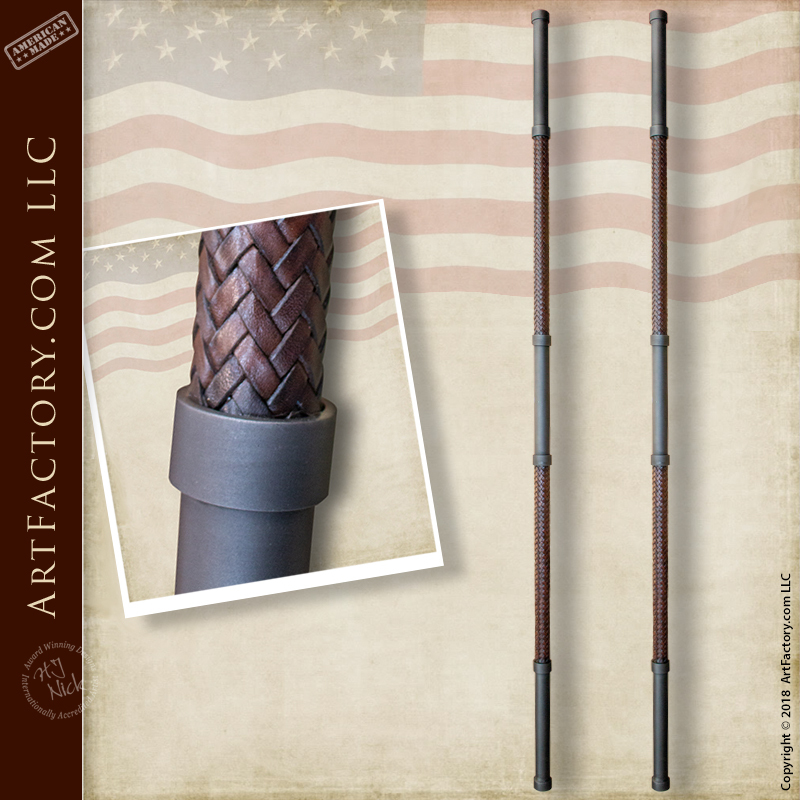 When nothing but the best will do, call ArtFactory.com today at 1-800-292-0008 for a quote on long pull style door handles, or any of our other custom, made to order hand forged hardware. Blacksmithing is not casting (also known as drop forging or hollow cold roll) or other fast, fake processes. Our fine art custom door pulls are created from labor intensive tried and tested techniques. Each custom pull is fired by coal and anvil hammered into shape by the hands of our master blacksmiths in our American factory in Scottsdale, Arizona, USA. All of our custom door handles are made from solid hand forged wrought iron with a natural patina (we never use faux paint or powder coating). Our custom door hardware will arrive to you virtually maintenance free. Available in any size, style, and finish, our custom door pulls can be custom fabricated in any design you can dream up. Order from our online catalog of custom door hardware, send in your own drawings or photos, or speak with one of our talented design engineers to get started. We at ArtFactory.com will hand make one-of-a-kind custom door handles just for you.